In late December, The Nest launched with all the fanfare you’d expect from a Bund-side collaboration between the Muse group and Bacardi. The opening party was a lavish affair, with the bar pumping out cocktails and the raw bar shucking oysters like they were going out of fashion, which certainly isn’t the case in Shanghai. But, while the sleek new neighbour to the Rockbund Art Museum certainly bears a resemblance to some of the flashier venues along the Huangpu, there is significant substance to back up The Nest’s style. Bacardi, under the guise of their Grey Goose vodka brand, and Muse have assembled an impressive team to run their new venture. Managing director Mark Klingspon has joined from ASC wines, and general manager Christoffer Backman’s CV includes stints at the Waldorf Astoria’s Long Bar and Coquille. Meanwhile former Park Hyatt bar manager Carson Xie is behind the bar, and in the kitchen executive chef Freddy Raoult brings a decade of experience in Helsinki to bear on The Nest’s raw and seafood focused dining menu. Together, they’ve created a remarkably laid-back and relatively unpretentious experience for such an address. 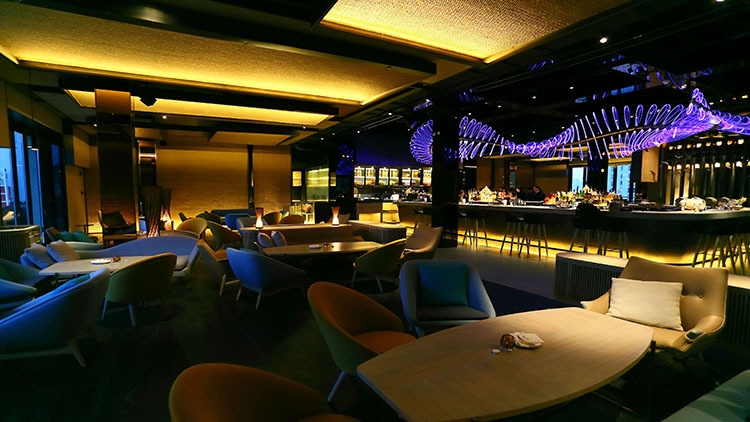 Although a colour-changing vertebrae-like sculpture over a central bar surrounded by lounge seating immediately brings to mind Unico, the vibe here is brighter and more relaxed than your average Bund-side drinking spot. Although the lights turn a little dimmer and the music a little dancier in the evening and at weekends, the preceding soundtrack features the likes of The Flaming Lips and Future Islands, rather than generic house. Once we’re seated at the bar, rather than hand us a menu, Xie asks us a couple of questions regarding what we’re in the mood to drink, suggesting a few broad options – sweet, sour or dry. After we request something sour, he delivers a beautifully decorated martini glass, topped with a dried rose head and three heart-shaped cinnamon syrup swirls. The cinnamon pear sour (78RMB), perhaps somewhat predictably, uses Grey Goose la poire vodka as a base, with eau de vie pear liqueur (Poire William), cinnamon syrup and lemon juice, for a drink that’s a smooth balance of sweet and sour. It’s a joy to drink. Tasting like a pleasingly alcoholic fresh lemonade, the Grey Goose le fizz (58RMB) is another hit. Here, the vodka is mixed with elderflower syrup, lime juice and soda for a simple but effective drink that serves as a refreshing palate cleanser in between items from The Nest’s raw food menu. While the cooked food menu features some alluring creations such as vodka-battered fish and chips (128RMB) alongside sharing plates made up of various cuts of wagyu beef and iberico ham (from 198RMB-298RMB), the raw and seafood dishes are one of The Nest’s main selling points and prove to be worthy accompaniments to the excellent cocktails. A dozen Fine de Claire oysters (198RMB) come on a seafood crate filled with ice and dotted with lemon wedges, a bottle of shallot vinaigrette and mini syringes filled with a ginger ponzu sauce. The thinly sliced salmon with blinis (128RMB) is a delicious bar snack and good for soaking up the booze, while the ‘scallop as it is’ (88RMB) dishes up Hokkaido scallops with an icy gingered green apple sorbet and fresh sea urchin with a citrus-tinged dressing. Although we admittedly experienced a few small service hiccups during the first few weeks (the delivery and clearing away of our food dishes was routinely delayed when we sat at the bar on one visit), we expect these to be promptly ironed out as the venue hits its stride throughout the year. And regardless, with outstanding drinks, food and atmosphere at surprisingly reasonable prices for such proximity to the city’s historic waterfront, The Nest is already a hugely impressive new opening.